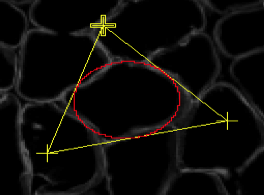 In microscopy some features only have their boundaries which are visible, for example bubbles in bright field microscopy. If we want to detect these kinds of features we need an active contour capable of detecting slim ridges forming a ring. We have for this used the Hessian matrix of the image to create a new kind of energy (called ridge energy) suitable to the detection of ridges by an active contour. We have also implemented other energies whose job is to attract the active contour close to the ridge before letting the ridge energy doing the rest of the job. One of these energy, called the distance potential, has given good result as it increases the stability of our active contour. 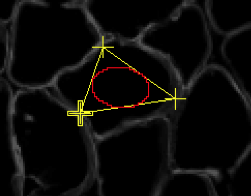 Figures 1, 2 show the detection of a muscular cell by our snake.